I am typically able to respond to all inquiries within a few hours to inquiries sent within normal business hours central time. “When plagiarists were being honest with me they would tell stories about wanting people to like them, being really impressed by the work, wanting to impress,” said New Orleans-based writer Jonathan Bailey who launched www.plagiarismtoday.com in 2005 after finding his short stories and poetry being widely copied online. “Copy-and-paste was the biggest step forward for the plagiarist ever,” says Jonathan Bailey, creator of the website Plagiarism Today. Jonathan Bailey, a consultant in New Orleans who runs the Web site “Plagiarism Today,” agrees. “There’s a lot of cultural differences in how people respond to plagiarism,” he said. Logos occupy that middle area where copyright and trademark can cross over. As cogently explained in Plagiarism Today’s post, “Trademark, Copyright and Logos,” nothing in the law makes the two rights mutually exclusive. So if your logo shows a requisite amount of originality, it can qualify for copyright protection. And if it’s also a company or product/service identifier, it can qualify for trademark protection. Jonathan Bailey, a writer for the website Plagiarism Today, outlines the conflict between intellectual property and appropriate fan tribute in his aptly-named article, The Messy World of Fan Art and Copyright. Bailey founded the company Plagiarism Today, based in suburban New Orleans, La. 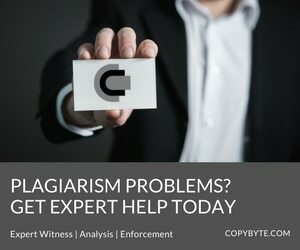 that specializes in tracking and stopping the mis-use of copyright information, as well as educating the public on how widespread plagiarism is on the Internet. Jonathan Bailey, runs the website plagiarismtoday.com, was hired by Whetstone to review the papers and concluded that “extensive portions” of Meehan’s dissertation were plagiarism of Boening’s work. Bailey, who is not an academic, analyzed the two papers using a computer program that looks for similarities in writing. He submitted a report claiming 38.7% of the second chapter in Meehan’s paper was copied from Boening’s. “Chasing sploggers, generally, is not worth it. The software that these guys use can generate thousands of spam blogs an hour. Even the people who gave them the blog to use don’t know who they really are,” says Bailey.